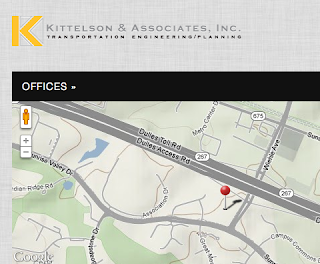 Kittelson & Associates, a Reston transportation consulting company, was named a Bicycle Friendly Business (Honorable Mention) by the League of American Bicyclists. The company is located adjacent to the Wiehle Ave Metro Station, not far from the W&OD Trail. Congratulations to Kittelson & Associates! Other Fairfax County businesses that have been designated as Bicycle Friendly Businesses include The Bike Lane (Silver), National Wildlife Federation (Bronze), and PricewaterhouseCoopers (Honorable Mention). Mark Blacknell, WABA Board President and Patch author of Clarendon Cycles, wrote a nice article on the Fairfax Bike Summit, Making a Difference, One Cyclist at a Time. He focused on the talk by FABB's Fionnuala Quinn, Growing Cycling in Fairfax. Getting safe cycling into school system education, getting transportation departments to build safe roads — that’s all important. But it often requires a lot of time, patience and the cooperation of large groups to accomplish. So what difference can one person make? Ms. Quinn had the answer for that question, distributing a flier that suggested actions that individuals can take to grow cycling. I'd thought — and written — about a lot of these ideas, but it was fantastic to see them all distilled into one sheet of paper. 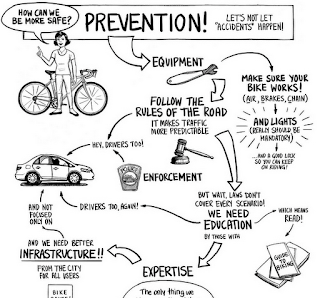 Check out this excellent graphic from the Bikeyface blog post Serious About Safety. Helmets help but prevention is really the key to reducing bike crashes. This is just a portion of the graphic. Click on the image on the right to see the full image. I am very pleased to give two special awards of recognition today to Randy Dittberner and Charlie Strunk for their work on behalf of bicyclists. Randy, who you will hear from later in the program, is a VDOT traffic engineer. He is primarily responsible for the first ever road diet projects in Fairfax County and possibly in the Commonwealth of Virginia, on Lawyers Road and Soapstone Drive in Reston. Those projects have greatly benefitted cyclists and have made those roads safer for everyone. Randy conducted numerous public meetings on the projects, patiently explaining the many benefits of road diets to all road users. Randy, thanks for your great work. 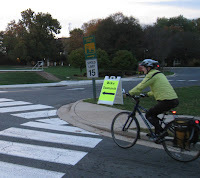 Back when FABB was formed in 2005 Fairfax did not have a bike coordinator. At that time Charlie Strunk, who was head of capital projects in the county, was our de-facto coordinator. One of FABB's first goals was to obtain funding for a bike coordinator position. In 2006 we met with then-Chairman, now Congressman Gerry Connolly. He agreed to try to find funding for the coordinator position, for a county bike route map, one of our other major goals, and a pilot on-road bike route program. 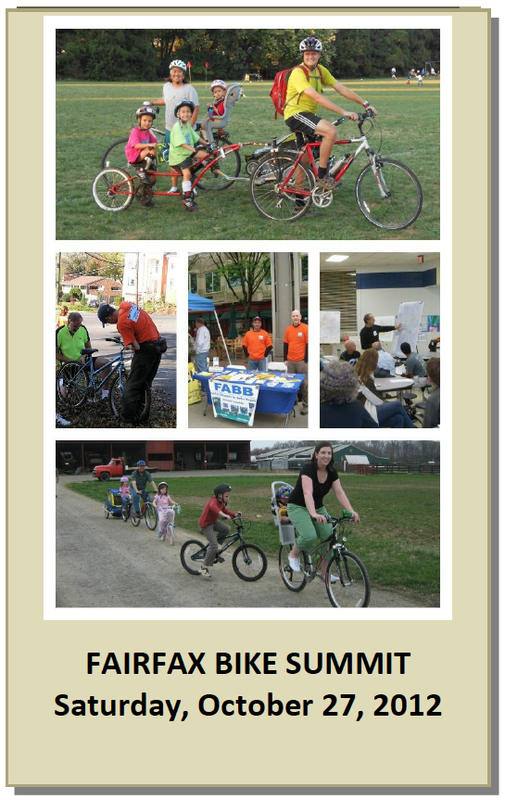 Later that year the Board approved funding for the comprehensive bicycle initiative and formation of the bike program. Without Charlie and the bike program we wouldn't have the bike map, bike racks on all Fairfax Connector buses, and most importantly, the recently completed Tysons and Fairfax County Bicycle Master Plans. Charlie, thanks for everything you've done to help bicyclists in Fairfax. Thanks to Kerie Hitt of FABB for designing and ordering the plaques. 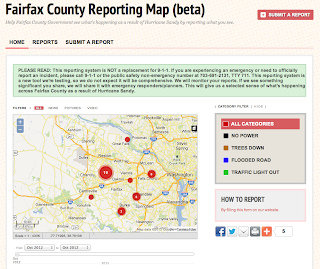 Fairfax County is testing a crowdsourced mapping tool that lets people report problems as a result of Hurricane Sandy. There are four types of problems that you can report: No Power, Trees Down, Flooded Road, Traffic Light Out. These problems affect cyclists. I hope that no one is riding today or tomorrow, although I'm sure there is someone who depends on using a bicycle to get to work who will ride. Over the next several days if you encounter any of the conditions above, why not use the interactive map to report them. Fairfax should have a version of this mapping tool to allow cyclists to report bicycle-specific problems. FABB would be glad to compile the data and work with the county bike coordinator to find solutions. Update: Here's another map from Fairfax County showing road closures. The VDOT Six Year Program meeting scheduled for Tuesday at 6pm is postponed to a date TBD. See the VDOT website for new dates (as soon as they are determined). The Vienna Transportation Safety Commission public meeting on W&OD Trail Safety that was also scheduled on Tuesday is postponed as well, date TBD. We will post the new date on this blog and on the FABB Events page. We had a great Fairfax Bike Summit today at George Mason University. An impressive lineup of speakers discussed how Fairfax could become a more bike-friendly place. 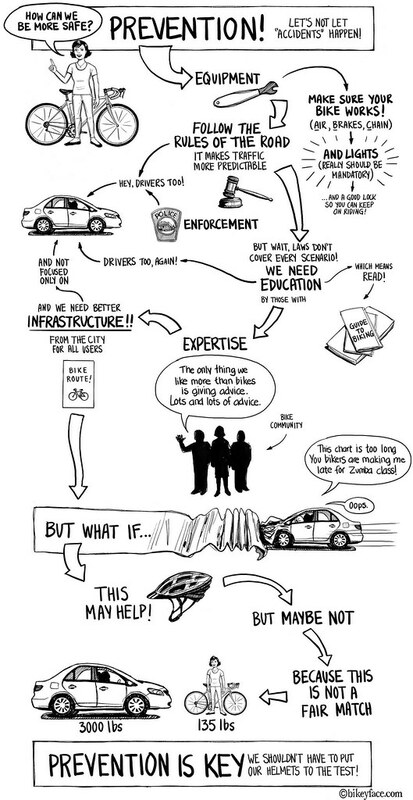 As Andy Clarke of the League of American Bicyclists said, it's not rocket science. Provide safe bicycle accommodations and people will ride. We'll be posting more photos and a wrap-up of the event in the next few days. We'll also post copies of the presentations on the Bike Summit page. The talks were videotaped and we'll try to load some of those videos as well. We'll also post a list of the suggestions we received for moving foreword. Thanks to all the speakers, volunteers, and participants who took time on a lovely Fall day to explore how Fairfax can become a better place to bike, which would benefit all residents by allowing people to get out of their cars for short trips, get exercise, and have fun. 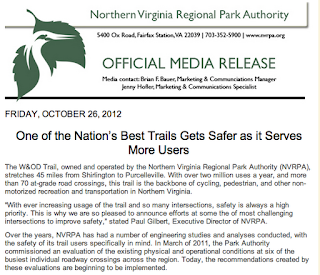 Today the Northern Virginia Regional Park Authority, which controls the W&OD Trail, announced proposed safety improvements to the Trail: One of the Nation’s Best Trails Gets Safer as it Serves More Users. • Relocate or eliminate parking area on the northwest and northeast corners. This work has been completed. • Add actuated rectangular rapid flash beacons to alert motorists to the presence of a trail user. • Consider construction of a 12 foot wide crossing island to create a refuge and to traffic calm the crossing. • Consider in the long term grade separation as the ideal improvement. • NVRPA and VDOT are working together to consider reducing the length of the northbound deceleration/left turn lane on Sterling Boulevard to expand median refuge. • Consider the addition of actuated rectangular rapid flash beacons to alert motorists to the presence of a trail user, based on results from Belmont Ridge Road. • NVRPA to work with VDOT and Loudoun County to expand the sidewalk network along Sterling Boulevard. • NVRPA and Fairfax County to work together to identify short term improvements to include: improved roadway markings, additional signage and potential lane width improvements. • Consideration to widen the median refuge. • Consider alternate signal timing to reduce conflict with trail crossing. • NVRPA and VDOT to address vegetation and terrain issues that affect sight line distance. • Consider replacing advanced trail crossing flashing beacon with Actuated Rectangular Rapid Flash Beacons. • NVRPA to realign trail approaches to orient better to the crossing for trail users and motorists. • NVRPA to work with Arlington County to consider adjusting signal timing and phasing. 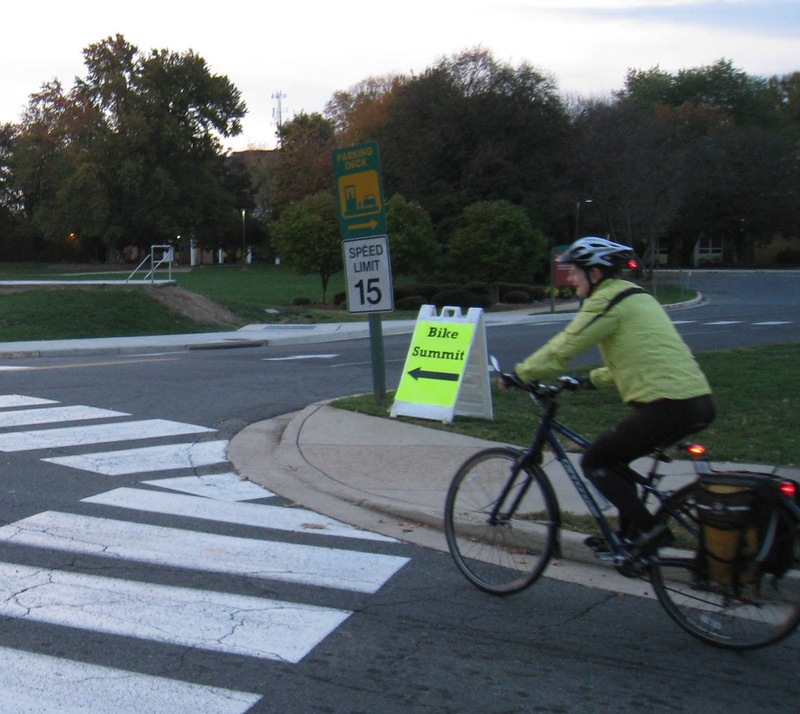 • NVRPA to work with Arlington County to consider turn lane options, such as relocating or adding additional signage. • The trail approaches will be realigned to intersect at a better angle to the roadway. Everything is coming together for the inaugural Fairfax Bike Summit tomorrow morning, Saturday October 27 starting at 9am at The HUB at George Mason University. We've got some great speakers lined up who will be talking about how we can convert Fairfax from a car-dominated place to a better place to bike. We set a goal for 200 people for the summit and there are now 208 people registered. We have room for a few more so you can still register online. We're encouraging people to ride to the summit. The weather forecast looks good despite the approach of Hurricane Sandy. There will be some indoor bike valet parking supplemented by bike racks outside The HUB entrance. There will be breakfast snacks, coffee, and tea. Several vendors will have transportation bikes and gear including A-1 Cycling, Bikenetic, bikes@vienna, Spokes, Etc. and The Bike Lane. Bikes for the World will have a table as will Fairfax County DOT, Mid-Atlantic Off Road Enthusiasts (MORE), REI, Lose the Training Wheels, and Tour de Cure. What's missing from this sign? The Stop signs on the W&OD Trail have been the subject of much debate over the years. See our numerous posts about the signs. Below the signs was another sign, "Required by Law." We've wondered about those signs since the Stop signs are not VDOT-approved signs and there is some doubt about their enforceability. The other day our riding partner noticed that the "Required by Law" signs have been removed. 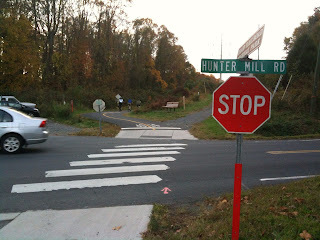 The photo on the right was taken at the Hunter Mill/W&OD Trail interaction. What we would really like to see are Yield signs; they warn cyclists but don't allow police to write tickets for not coming to a complete stop. The Stop sign saga continues. Dr. Gridlock wrote about this topic again today. A meeting on the future of the Fairfax County Parkway is being hosted by Springfield District Supervisor Pat Herrity tonight. The meeting starts at 7pm at Robinson Secondary School, 5035 Sideburn Road Fairfax, VA. 22032. It's important that any new bridges along the Parkway accommodate cyclists with direct, safe routes. 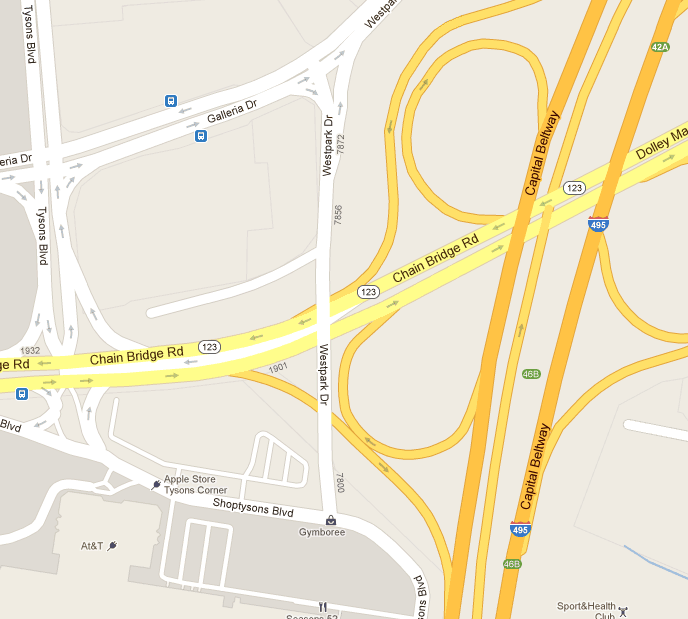 The bridge at Eldon St. in Herndon is an example of providing a bare minimum accommodation. Cyclists must cross an exit ramp, 4 lanes of traffic, and an entrance ramp. Ideally cyclists shouldn't be forced to cross the intersection at grade; the bike/ped facility should be part of the bridge. The current Parkway trail needs to be fixed. 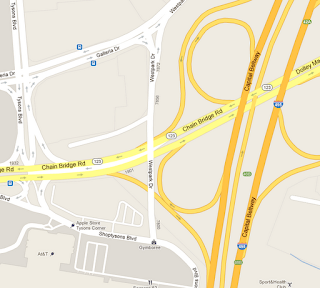 There are several dangerous crossings of entrance/exit ramps at Sunset Hills Rd, the Dulles Toll Road, Route 50, and others. Cyclists should be able to safely use the paved shoulders in the future. We've heard there's a proposal to add rumble strips to the shoulders which would be a disaster for any cyclists hoping to ride there. It goes without saying that the Parkway trail needs to be repaved. FABB recently assisted VDOT, which just completed a study that assessed the condition of the trail. According to a new study entitled Route Infrastructure and the Risk of Injuries to Bicyclists: A Case-Crossover Study, the presence of bicycling infrastructure has a significant impact on reducing bicycle crashes. The conclusion of the report: "The lower risks on quiet streets and with bike-specific infrastructure along busy streets support the route-design approach used in many northern European countries. Transportation infrastructure with lower bicycling injury risks merits public health support to reduce injuries and promote cycling." The research will provide weighty evidence for advocates of dedicated bike infrastructure precisely because transportation engineers have long believed the exact opposite to be true. For years, they’ve counter-intuitively argued that you’re actually better off learning to ride alongside cars than having your own bike lane. "That became a very often repeated philosophy," says Kay Teschke, a professor at the University of British Columbia and the lead author of the new study. She traces it back to a guy named John Forester, who popularized the idea of "vehicular cycling" 40 years ago. Forester famously argued against separated bike lanes in Palo Alto, on the grounds that bikers should learn instead to behave like drivers. Some spotty research followed on this topic that seemed to reinforce Forester’s idea: Biking in traffic did appear to be safer than many of its alternatives. But the alternatives that researchers had to examine in North America were unpaved routes, sidewalks, off-road and even mountain bike trails. At the time, we had little of the dedicated commuter bike infrastructure many cities are just creating now. "I think a little bit of what happened was [engineers] knew this was counterintuitive, they knew the few studies out there were not particularly well controlled or appropriate," Teschke says. "But it just further entrenched them." So along comes this new study. Teschke and her colleagues worked with five hospitals in Toronto and Vancouver to identify adult bikers who were treated in an emergency room within 24 hours of a bike accident. Over an 18-month period between summer of 2008 and fall of 2009, they identified 2,335 injured cyclists. Of that group, 690 were considered eligible for the study and agreed to participate. In the end, Teschke was still concerned about one other question: Are the safest routes the same routes that bikers actually want to use? Several years ago, she conducted another study into this question of preferences, using the same 14 route designations employed in the latest research. "We were told in advance that young males and people who are experienced riders would tell you they’d rather ride on major streets without bike infrastructure," she recalls. "It turned out not to be true. Everyone had the same order or preferences." So how did those preferences line up with this latest injury data? "When my statistician finally finished doing the analysis for the injury study, I can remember sitting at the desk, and my heart was just pounding because I thought 'what am I going to do if the injury results are the opposite of the preference results?'" Teschke says. How can anyone advocate for safer bike infrastructure if no one wants to use it? “Isn’t that going to be just awful for the present situation?” Teschke was relieved (bike advocates more broadly should be, too). Here the results of the two studies are plotted on a single graph (above). Hat tip to the WashCycle. The W&OD Trail crossing at Wiehle Ave is one of the most dangerous on the trail. The majority of crashes occur when eastbound cyclists cross the southbound lanes. What has happened multiple times is that straight-through traffic is stopped for the red light at Sunset Hills Rd but the left turn arrow turns green. Cyclists proceed into the crosswalk not realizing that fast moving motorists may be trying to catch the green light. Our blog entry about a crash at that site prompted numerous comments about similar crashes or near misses at that location. We're pleased to report that $2.3 million has been allocated to build an overpass at that location. It was funded as part of improvements identified in the Reston Metro Access Group study, in which we participated several years ago. There is a relatively low-hanging power line directly above this location which could complicate the project. A tunnel would be another option but would likely cost more than $2.3 million. In the interim, $46,000 was allocated for installing a raised median and additional signage there. This is a relatively low cost measure that would help slow motorist at the crosswalk, especially those using the left turn lane. Thanks to the Board of Supervisors for funding this project. 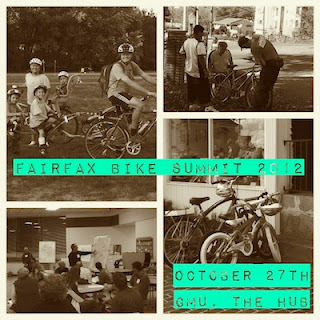 The Fairfax Bike Summit will be held in just over a week and registration is filling fast. Free online registration is available. If you want to attend you should register now. There may not be any walk-on registrations if we reach our goal of 200 attendees, so it's best to sign up now. We will also be giving two special awards of appreciation. There will be representatives from several area bike shops with samples of transportation bikes and gear. Reps from several bike organizations will also be present. At the end of the summit, at 2pm, there will be a guided bike tour of the GMU campus highlighting the many new bike facilities installed over the past couple of years. Loaner bikes will be available from the GMU bike share program and from The Bike Lane. If you are attending the summit, please consider coming by bike. There will be free indoor bike valet parking provided thanks to GMU volunteers and bike racks from bikes@vienna. If you like more information or would like to volunteer, contact Bruce Wright, chairman@fabb-bikes.org. FABB will be meeting from 7:30-9pm tonight at Patrick Henry Library. We will be spending most of the time discussing the upcoming Fairfax Bike Summit on Oct. 27 at GMU, from 9-2pm. Everyone is welcome, especially if you want to help out at the summit. Vienna Police have arrested a man for allegedly intentionally striking a cyclist with his vehicle after a dispute on Maple Avenue while both were in motion. John Arthur Thorpe, 52, of Bristow, was arrested Aug. 18 for assault and aggressive driving and taken to the Fairfax County Adult Detention Center, said Officer Gary Lose, VPD spokesperson. He was released on recognizance, according to the General District court online database. A court date has been set for 9:30 a.m. Oct 15. Around 6:30 p.m. Aug. 16, a cyclist believed a vehicle to be traveling too close to his bicycle as both traveled westbound on Maple Avenue near Nutley Street. The cyclist reported he began banging on the vehicle's window to urge the driver to move over. 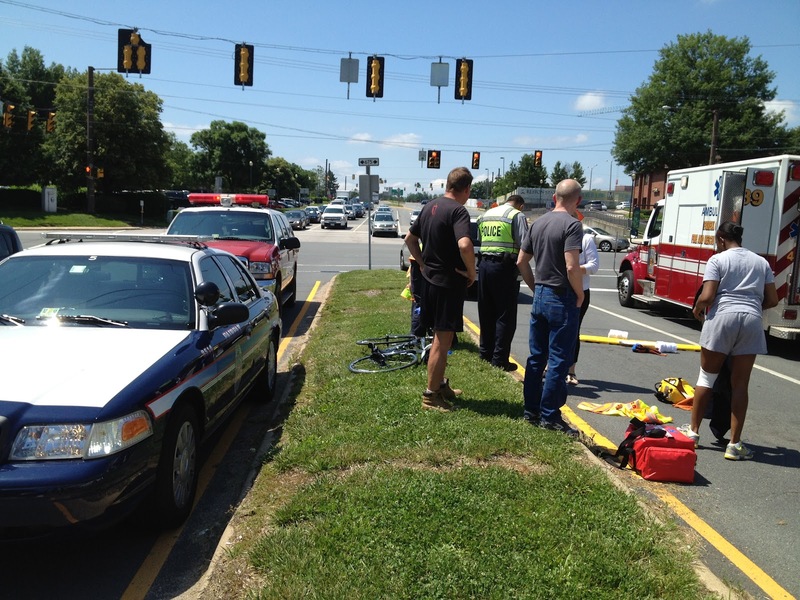 Witnesses reported it appeared Thorpe intentionally struck the rear tire of the bicycle, causing the cyclist to fall. Update: The case was delayed until November 5, 9:30 a.m. at the Vienna Courthouse located in Vienna Town Hall, 127 Center St. In today's Washington Post there is a letter from our friend Rhonda Krafchin to Dr. Gridlock about motorists who stop abruptly for cyclists on the W&OD Trail. Her concern is: "If I’m obeying my stop sign, I may have a driver to my right come to an unsigned stop. Before I proceed, I need to be clear what a driver to my left is doing, and that driver may not be stopping." That's why I always recommend that cyclists proceed through a crosswalk "one lane at a time." Once you're sure you've controlled that lane, proceed to the next one. You summed up the situation in the first line of your comment on the letter from Rhonda Krafchin in Sunday's Post: "Thus, we continue our conversation about who’s supposed to do what at crossings and when they’re supposed to do it." While I understand Rhonda's concerns, I also appreciate motorists stopping for pedestrians and bicyclists at crosswalks. The stops signs on the W&OD Trail adjacent to crosswalks are a contradiction. Normally a stop sign indicates a road user must wait until traffic clears before entering the intersection. From 46.2-821: "Before proceeding, he shall yield the right-of-way to the driver of any vehicle approaching on such other highway from either direction." A pedestrian (and bicyclist) has the right-of-way in a crosswalk once they've entered the crosswalk. From 46.2-924, "A. The driver of any vehicle on a highway shall yield the right-of-way to any pedestrian crossing such highway: 1. At any clearly marked crosswalk, whether at mid-block or at the end of any block;" Trail users can't disregard oncoming traffic before entering the crosswalk, but they aren't required to stop if there is no crossing traffic. VDOT recently conducted a study of the zig-zag markings adjacent to crossings on the W&OD trail. As part of their study they recognized this contradiction: "RECOMMENDATION 5. A review of the Code of Virginia should be undertaken with respect to those sections dealing with trail users on multiuse pathways and their obligation to comply with non-signalized traffic control devices. The purpose of the review should be to determine if legislative changes could help alleviate the confusion about right-of-way, and if so, to suggest appropriate legislative change proposals. Such a review could be initiated, or led, by VDOT’s Traffic Engineering Division with assistance from staff at VTRC. A cursory review of the Code language in this study suggested that trail users on multiuse pathways may not be obligated to comply with non-signalized traffic control devices where the trail intersects a roadway. In addition, the research found there is confusion among motorists and trail users about right-of-way laws regarding the W&OD Trail where a STOP sign is directed toward the trail users. This confusion could compromise safety at these and other similar multiuse trail/roadway intersections." A major problem with the W&OD Trail stop signs is that police have used them as an excuse to target cyclists for not coming to a complete stop, even when there is no crossing traffic. However, in at least one instance, a cyclist was ticketed by police who used 46.2-821 as the reason. That ticket was dismissed since a trail is not a "highway." Today some FABB members rode to the Oak St. bridge over the Beltway to participate in a ribbon-cutting ceremony for the new bike facilities on that and many of the other 50 bridges that were rebuilt as part of the 495 Express Lanes project, formerly known as the HOT lanes. The Oak St. bike lanes have been in place for some time but several of the other bridges are just now opening, including the new sidepaths on the Route 7, Westpark Dr, and Lee Hwy bridges. While many of the bike facilities are not ideal, in most cases this is the first time there has ever been a bike facility on those bridges. Starting in 2007 FABB fought hard to ensure some facilities were included in the project. We initially planned to use the sidepaths on the Lee Hwy bridge, but the side paths were too narrow and aren't really a bike facility. Instead there are supposed to be wide curb lanes on that bridge and it wasn't safe to try to simulate a ribbon-cutting there. The outside lane isn't really wide; there is a painted stripe 3 feet from the curb making it an 11-foot lane with a 3 foot shoulder which isn't very useful for cyclists. I'd prefer to see the lane without the stripe. After the ribbon-cutting we rode to the new Mosaic District (that I wrote about earlier) to attend the grand opening of Fresh Bikes. We met the manager Stacey and dropped off some FABB rack cards. It's a very nice shop, with many fine bike-oriented details including a bike chain used as edging on the front counter and bike chains used to support sections of the ceiling structure. We especially liked the automatic double-door entrance. We didn't see many transportation bikes; Fresh Bikes is a bike store for the "performance-minded." Some of their hybrids and cross bikes could be used for commuting. We wish them well and we hope to work with them in the future. Some of us then stopped at a nearby coffee shop for snacks and drinks. When we left we rode around the streets that are open and only saw one set of bike racks. They were nice racks that were like a U rack but with some style. There should be many more racks in place for visitors and we'll check no future plans for racks. Finally, as we were leaving the development we decided to use Eskridge Rd to travel north where it turns into Merrilee Dr. We were in the straight through lane with no cars behind us and we waited through 2 full cycles before a car finally appeared. Under VA law we are allowed to go through the light after 2 cycles, but there should be a bicycle-sensitive sensor present. Traffic is so heavy on Lee Hwy that legally running the red light was not an option. By the way, Eskridge Rd will soon be open south toward Route 50. That means that from Dunn Loring Metro station it will be possible to ride a route parallel to Gallows Rd all the way south to Woodburn Rd using Merrilee Dr to continue on Eskridge Rd to Williams Dr across Route 50 to Willow Oaks Corporate Dr to a new road that leads south past the Ronald McDonald House to Inova Hospital and on to Woodburn Rd. A new report from the Center for Regional Analysis at GMU concludes that we're just going to keep driving and we need more roads for those cars. The report was funded by the 2030 Group, an organization of major developers in the region, including the infamous Til Hazel, who supports multiple outer beltways that will foster continued sprawl development. When our roads are crumbling in the DC metro area the 2030 Group wants to spend scarce transportation funds on these outer beltways. Using funding from developers with significant interests in land in outer suburban locations, researchers at George Mason University's Center for Regional Analysis have issued a new report arguing for massive investment in highway infrastructure. Experts at the Coalition for Smarter Growth disagree. "The GMU report is based on flawed and outdated assumptions and would lead our region down an unsustainable development path," said Stewart Schwartz, Executive Director of the Coalition for Smarter Growth (CSG). "The report ignores the fundamental shifts in real estate demand, changing demographics and market demand. The GMU view would also leave behind Prince George's and older parts of eastern Fairfax and eastern Prince William counties," said Cheryl Cort, Policy Director for CSG. "While dressed up with an acknowledgment of transit, the report is focused on justifying a wasteful expansion of highways which would fuel more spread-out development and yet more traffic," said Schwartz. "This includes real estate mogul and 2030 Group backer Til Hazel's primary goal of an outer beltway in Virginia." 1) Ignores fundamental changes in the residential real estate market: The report relies on population projections which continue to include old assumptions about growth in the region's outer suburbs and still don't fully reflect the dramatic long-term shift in real estate demand. 2) Uses old regional activity centers data: The report uses the old regional "activity centers" data, instead of the most up-to-date activity centers, which means it omits and ignores many of Prince George's County's Metro stations, Fairfax's Route 1 corridor and a number of other older commercial corridors which are planned to be efficient transit-focused centers. This omission biases the report toward sprawling auto-dependent areas. 3) Fails to acknowledge the failure of highway expansion to fix congestion: Transportation experts have acknowledged that highway expansion in metropolitan areas typically fails and that the new capacity induces more auto-dependent development leading to a return of congestion in as little as five years. 4) Fails to fully account for the benefits of transit and transit-oriented communities: The report fails to acknowledge the critical importance of transit to manage peak hour commuting. By offering a high-capacity commuting alternative, transit offers tens of thousands of Washington area residents an alternative to driving in traffic. The report also fails to note that mixed-use transit-oriented communities not only shift many trips to transit, but they also maximize walking and biking trips and shorten many car trips. Update: See the GreaterGreaterWashington post about Northern Virginia Transportation Alliance's take on the GMU report. As part of the 495 Express Lanes (aka HOT lanes) project, the bridge on Westpark Dr over Route 123, that leads from Tysons Corner Center to Galleria Dr, was rebuilt. The bridge now has bike lanes and wide sidewalks giving cyclists and pedestrians much better access in that area. We discovered the new bike lanes today after teaching a bike maintenance class at PwC, a major employer located on Tysons Blvd., within sight of the Westpark bridge. Our contact there uses the bridge on her commute to work and she pointed out the new lanes. We knew they were planned but they hadn't been stripped the last time we rode there. As you can see from the photo on the left, there is a transition from the sidepath to the bike lane. This is on the north side. I didn't see any transition for those cyclists on the south side approaching the sidepath from the other direction. I assume they would cross at the crosswalk and somehow enter the trail. Unfortunately the trail comes to an abrupt end not far away. It is planned to extend all the way to the bike lanes adjacent to the Towers Crescent (Shopping Bag) building, but probably not until there is more construction on the mixed use development planned for this area. Tysons is slowing becoming more bike-friendly. As we mentioned earlier this week, there are now bike facilities on the Route 7 bridge over the Beltway, also a result of the 495 Express Lanes construction. Many more people will ride in this area if conditions continue to improve. NVRPA is having the W&OD Trail repaved between Vienna and Reston. The trail in that location was damaged this summer when work was done to reinforce the banks of the stream adjacent to the trail. There is a short detour that follows the gravel trail parallel to the paved trail. Two days ago when I was riding through that area I noticed two cyclists on road bikes with narrow tires ignoring the detour. The detour is there for a reason. It's a work area and there are conditions that are hazardous for cyclists. Workers don't need to spend their time worrying about inconsiderate cyclists interfering with their work. It likely delays the work and prolongs the time that the rest of us have to use the detour. When I asked one cyclist why he didn't use the detour he said he didn't want to ride on the gravel. Well, we didn't want to ride there either but we respected the signs. It's selfish and inconsiderate to ignore the detour signs. Returning home from a meeting at WABA yesterday afternoon we rode through Falls Church on the W&OD Trail and came across two Falls Church police in the process of issuing a ticket to a cyclist at the Great Falls St. crossing. From what I was able to gather, the cyclist had rolled through the stop sign when motorists were stopped and waiting. Under normal circumstances, i.e. where there is no stop sign, this would be perfectly legal. Current VA law states that no pedestrians and bicyclists "shall enter or cross an intersection in disregard of approaching traffic." It says nothing about coming to a complete stop before entering the intersection. Writing a ticket in this situation accomplishes nothing other than to punish cyclists. I've seen police on bicycles roll through the W&OD stop signs. The stop signs themselves are not VDOT sanctioned and VDOT has questioned their legality. There is at least one instance in which a similar ticket was thrown out because the cited law does not apply to a bicyclist on a trail. When we tried to point this out to the officer he told me to back off, that I was hindering his "investigation." If I were issued a ticket in this situation, I would fight it in court. Fairfax County is hosting the final four meetings on transportation funding this week. Cyclists are encouraged to attend one of these meetings and speak up for the need for bicycle project funding. In the next 10 years, funding needs for transportation is projected to be $8.1 billion with only $5.1 billion in anticipated revenues. This leaves a total $3 billion deficit over the next 10 years or a $300 million annual deficit. The Fairfax County Board of Supervisors asked the county’s Transportation Advisory Committee (TAC) to work with county staff to engage county residents and businesses in a dialogue about the county transportation needs, priorities and revenue options. 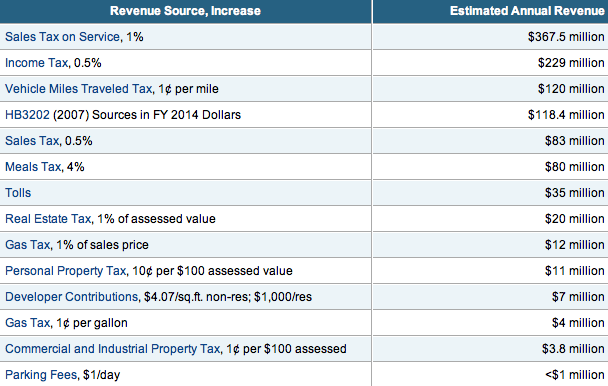 There are numerous sources of revenue that could be used for funding transportation. 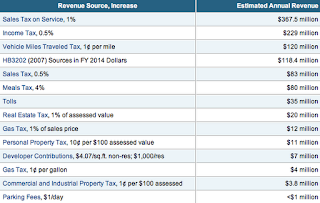 Since these potential revenue sources will have an impact on county residents, businesses, and others who make purchases or do business in the county, it is important to get feedback from the community. The Board of Supervisors has not made any decisions about whether to pursue adding funding for transportation. The purpose of this dialogue is to gauge the community’s interest, and to determine which revenue source might be most acceptable. The results of this effort will be shared with the Board. The Board may consider taking action after it receives the results, but is not required to do so. You can also take the transportation funding survey until October 12. Today I had a chance to check out the new major paved trail parallel to Route 7 on the bridge across the Beltway. There is an approximately 10 foot wide concrete trail on each side of the bridge that will connect the Pimmit Hills area just east of Tysons with the greater Tysons area. This bridge has never had adequate pedestrian facilities, much less bike facilities. As I recall, there was a very narrow concrete ledge that some people used to walk across the bridge. Those cyclists who dared to try to cross, rode in the travel lanes, with high speed exit and entrance ramps onto the Beltway. One reason that FABB started doing bike light giveaways was after a cyclists was killed while riding across the Beltway on Route 7 in Tysons. Since 2007 a major goal of FABB has been to ensure that bike facilities are included on the bridges across the Beltway. Most Beltway bridges between I-95 and the American Legion Bridge were reconstructed as part of the HOT lanes project, now called the 495 Express Lanes. See the many blog postings on our HOT lanes advocacy. We attended public meetings, wrote a Post Outlook section article, and met with county and VDOT staff to ask that the facilities that are indicated on the county Trails Plan be included in the project. With support from county DOT and VDOT, those facilities are close to becoming a reality. While they are far from perfect, in most cases they provide the first accommodations for pedestrians and cyclists on the Beltway bridges. As you can see from the photo above, there is still some work to be done but we expect the facilities to be open in the near future. Now that many of the bridges accommodate bikes, Fairfax Co and VDOT need to have a concerted effort to connect those facilities with bike routes on either side of the bridges. The photo on the right shows where the trail on the north side of Route 7 ends, at an exit ramp from the Beltway onto westbound Route 7, with no trail connection to the service road or sidewalk. Connecting this trail should be a high priority for Fairfax DOT and VDOT. 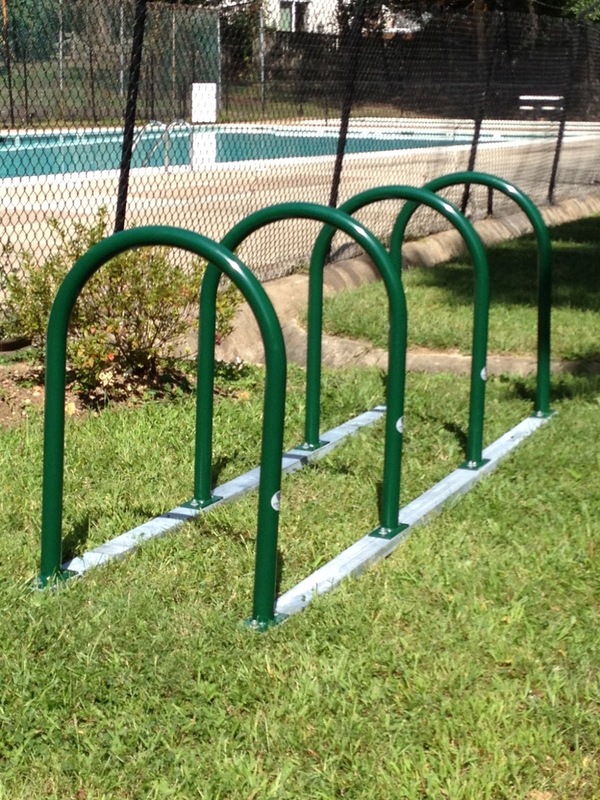 FABB recently purchased 4 inverted U racks that will provide bike parking cyclists at a local pool in Falls Church. Two years ago FABB received a grant from the Transurban Community Grant Program for bike light giveaways, purchasing bike racks, and conducting bike commuter classes. We've held several bike light giveaways, conducted bike commuting seminars in Tysons, and provided racks for cyclists in Vienna and Falls Church. The Glen Forest Pool in Falls Church, VA was trying to provide enticements to local pool users to get them out of their cars. Too many people who lived close to the pool were driving to and parking at the pool, which on busy days really crowded the limited parking area. When pool members were asked about biking to the pool, many noted concerns about the absence of good bike parking. Thus the need for a bike rack was realized. With FABB's great assistance, the Glen Forest Pool now features a wonderful bike rack with space for 8 or more bikes to park. The Pool committee will be publicizing the presence of the rack to everyone in the neighborhoods nearby, all with the intent of increasing the use of bikes by pool-goers and thus decreasing the use of cars. With the purchase of these racks, we've used all the grant funding for lights, classes, and racks. We've applied for additional funding for conducting bike light giveaways this Fall and Winter. 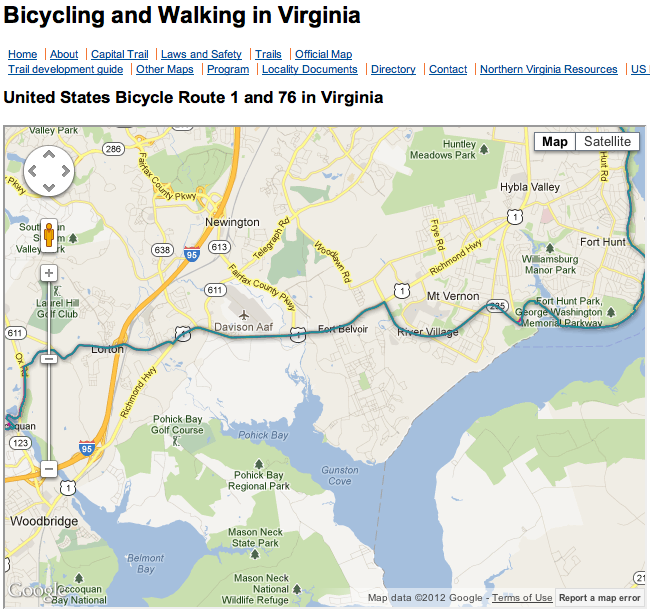 VDOT recently released an updated version of the state bike map, Bicycling in Virginia. The map shows major bike routes in the state, including United States Bicycle Routes (USBR) 1 & 76, Skyline Drive, Blue Ridge Parkway, the Virginia Capital Trail, and a few other major trails. 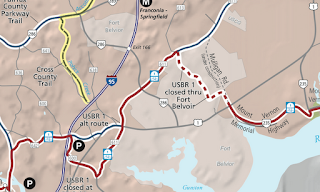 There is a Northern Virginia inset showing details of USBR 1, the Fairfax Co Parkway Trail, the Cross County Trail and others. Unfortunately there is so little road detail that the map can't be used for navigating any of these routes. The FFX Co Parkway trail is shown incorrectly in a couple of places, including showing that it crosses I-66 parallel to the Parkway. In that section there is an unsigned detour away from the Parkway. 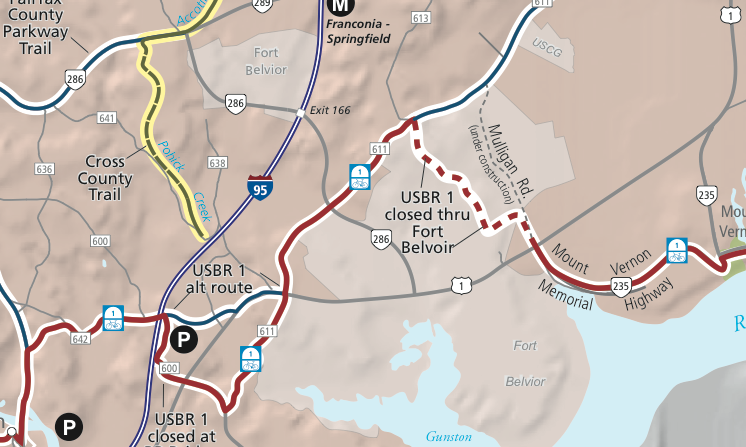 USBR 1 as shown in the NoVa inset shows the section through Ft Belvoir, that has been closed for many years, as a dashed line. On the VDOT website there is an interactive map of USBR 1 & 76 that shows the route following Route 1 for an extensive stretch, a very dangerous route. Adventure Cycling mostly follows USBR 1 and they have identified an alternative route, that could have been shown on the state map. One day we would like to see a state bike route map that shows the many great routes that exist on Virginia's back roads. BikeVirginia has extensive maps showing good routes throughout the state that could be used. The map could include some of the major routes in Northern Virginia that are identified on the Arlington, Alexandria, and Fairfax bike maps.